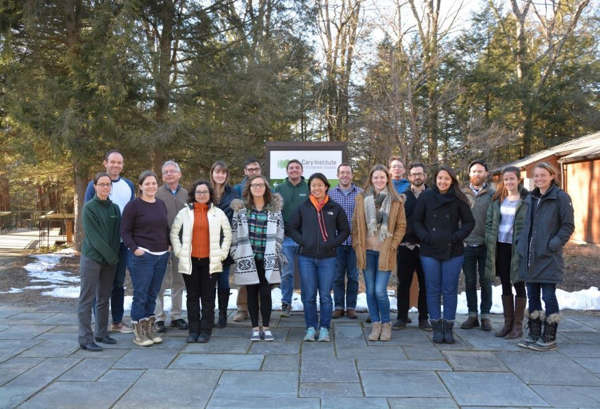 Every year the Cary Institute, an independent environmental research institute located in Millbrook, NY, hosts a course titled Fundamentals of Ecosystem Ecology (FEE). This course allows a small group of students from around the world the opportunity to learn from and interact with leading experts in the field of ecosystem science. In fact, a number of researchers at the institution have played pivotal roles in defining this discipline and pushing the boundaries of knowledge regarding ecosystem structure and function. Cary Institute researchers have substantial expertise in the following fields: freshwater health, infectious disease ecology, urban ecology, invasion ecology, climate change and biogeochemistry. The 2016 FEE course was loosely organized around four major topic areas: energetics, biogeochemistry, frontiers in ecosystem ecology and professional development seminars. Subject matter experts held either lecture-based or discussion-based sessions followed by an in depth discussion of related primary literature led by students in the class. Major topics included primary and secondary productivity, decomposition pathways, an overview of biogeochemistry, coupled elemental cycling and nutrient cycles with the carbon, nitrogen and phosphorus cycles each having their own lecture. We also explored cutting-edge topics in conservation, human ecological systems, coupled human-natural systems and urban ecology with Cary scientists who are leading the way in these fields. One aspect of the class that was particularly enjoyable was the professional development sessions. One of the session was devoted to a mock NSF proposal review panel, led by a Cary scientist and former NSF program officer. This provided invaluable insight into the proposal review process and allowed students to ask questions regarding review and the organization of funding. I would strongly recommend this course to other students in EEES. The class covers a wide range of topics and allows students to solidify their fundamental knowledge and move into high level discussion of each subject area. The opportunity to interact with leading scientists in ecosystem ecology in both a learning and professional development context was invaluable professionally and personally.